Toast notifications are, without any doubt, one of the most used techniques when it comes to notify something to the user, even when the app isn’t running. It’s almost impossible not to miss a toast notification: it plays a sound, it’s displayed on the screen, it’s stored in the Action Center and, on the phone, it makes also the device vibrate. More ways to customize the look & feel of the notification. You can add images, multiple lines of text, etc. Support to interactive notifications. You can add interactive elements (like buttons or text boxes), which can be handled by a background task. In this post I would like to focus on the ways you can send a toast notification, specifically on scheduled toasts, since you may find some challenges in implementing them in the proper way. Within the app: the Universal Windows Platform includes APIs like ToastNotification and ToastNotificationManager which can be used to send a toast notification when the app is running in foreground. From a background task: the same APIs can be used also in a background task, so that toast notifications can be sent also when the app isn’t running. Push notifications: a toast can be sent by a backend and received also when the app isn’t running. In this case, the app subscribes to a service offered by Microsoft (called WNS) and receives back a Url, which identifies the unique channel for that device. When the backend wants to send a push notification to that device, it executes a HTTP POST request to the Url including, in the body, the XML that describes the notification. Scheduled notifications: by using the same APIs you use within the app you can create a toast notification and schedule it to be displayed at a specific time and date, even if the application isn’t running. This is the scenario we’re going to focus from now on. The first step is to define the XML with the toast content. 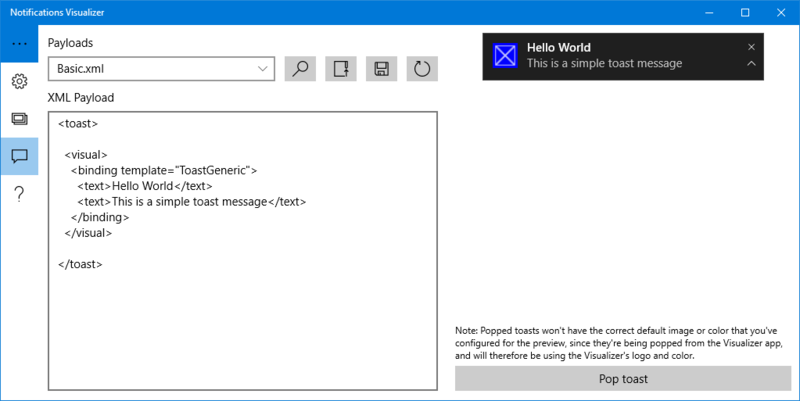 To learn how to define a toast, you can refer to the documentation and you can get some help using Notifications Visualizer, a Windows Store app by Microsoft that is able to give you an instant preview of how a specific XML will be rendered. Once you have the XML, you need to use it to create a XmlDocument object by calling the LoadXml() method and passing, as parameter, the XML string. Be aware that there are multiple classes called XmlDocument in the Universal Windows Platform: the one required by your scenario belongs to the Windows.Data.Xml.Dom namespace. The last step is to create a new ScheduledToastNotification object, which is very similar to the basic ToastNotification one. The difference is that, this time, other than the XmlDocument object with the toast definition, you have to specificy also the date and time when the notification will be displayed, using a DateTimeOffset object. In the sample, we’re scheduling the notification to be display after 10 seconds that this code is executed. In the end, we schedule the notification by calling the AddToSchedule() method of the ToastNotifier object, which you can get by calling the CreateToastNotifier() method of the ToastNotificationManager class. Text = "This is a scheduled toast!" We don’t have too many background tasks registered. On low memory devices, in fact, there’s a maximum number of tasks that can be registered and, if it has been reached, the OS will deny the request. The background task is granted access to interact with the device also when it’s locked. As you can see, the second scenario is the one we need also for our scheduled toast notification: without this approval from the OS, we won’t be able to wake up the phone even if it’s locked. However, there’s a catch: the fact that we’re using scheduled toast notification doesn’t mean that we are necessarly using also a background task in our application. The problem is that, if we try to call the BackgroundExecutionManager.RequestAccessAsync() method without having a background task registered, we’ll get an exception. As entry point, any value (for example, Test). It doesn’t have to be a real entry point for a task, since we won’t try to register the task for real. That’s all. Now if you repeat the test of scheduling a notification and locking the phone before it’s displayed, you’ll correctly see the phone waking up and displaying the toast, like if it happens for regular push notifications. This entry was posted in Universal Apps, UWP, wpdev and tagged Universal Windows Platform, Windows 10. Bookmark the permalink. I couldn’t make toast notification to be called when I have locked me phone. I was unable to find a solution and then I have found your page. I know about RequestAccessAsync but I have thought that it is needed only for background tasks. Your tutorial helped alot. 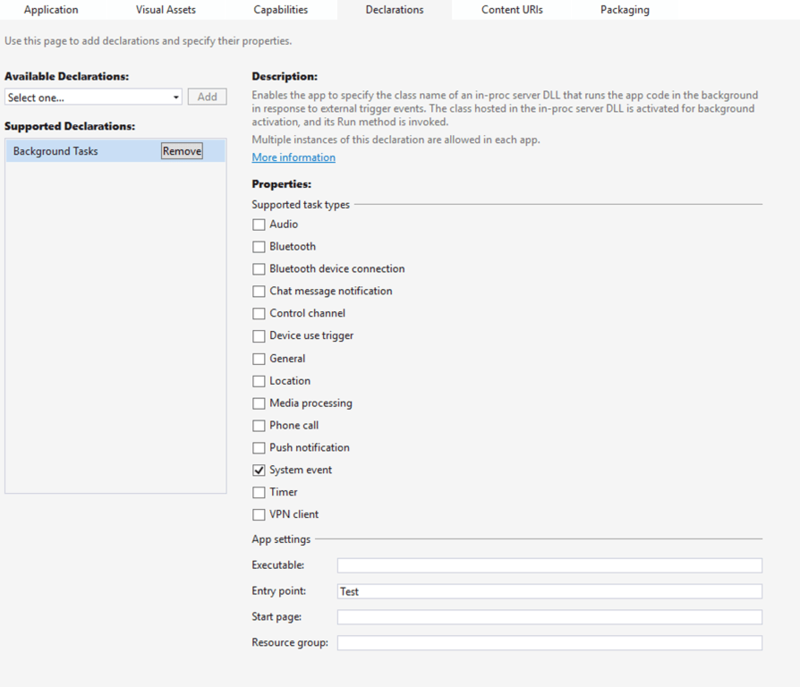 Do you know whether this is documented on MSDN that RequestAccessAsync is needed for the toast? If I may ask, have you solved recurrency for notifications? From what I understand if I want a notification to be called avery day I can mak multiple notifications and after some time add new notifications or use background task which would add new notifications. From my understanding Microsoft’s support for recurrency is on their backlog. Many thanks for your article. Hello, great to know you found the article useful! The MSDN documentation doesn’t contain the information I’ve shared in this post yet, but I know the documentation team is working to get if fixed. Regarding recurrence, I’m not aware at the moment of the plans of supporting it. I know it’s in the backlog, but I don’t know if and when will be delivered. I am launching a toast from a background task. Do you know how to process toast buttons when the toast was launched from the background task? Hi, you need create another background task, which is specific for handling the interaction from the toast notification. You’ll find a sample on my GitHub repository https://github.com/qmatteoq/dotNetSpainConference2016 The sample is in the Toasts folder of the solution.